In just a couple of months, spring will be arriving and with it comes the opportunity to update and improve our gardens. It’s the perfect time of year to make any necessary changes to outdoor spaces, that will allow you to truly make the most of them when the warmer summer months return. Every year, there are new trends and suggestions for outdoor spaces, particularly when it comes to paving and landscaping. These tips aim to help keep your garden modern, attractive and appealing. If 2018 is the year that you vow to give your outdoor space a refresh, read on to discover some paving and landscaping trends for the year, that are bound to instantly boost the appearance of your tired outdoor space. Here in the UK, homes and outdoor spaces are growing smaller by the year, especially as our cities grow and the need for more housing increases. Even if you’re outdoor area is small, there’s still the opportunity to make the most of the space you have, especially if you can create a multifunctional small space. From floating tables and benches, to wall gardens and kids play areas that can transform into evening dining areas; a smaller outdoor space can still be thoroughly enjoyed, using some careful planning and clever space saving solution, a trend that will be adopted by many in 2018. For many of us, gardens offer up the opportunity to escape the complexities of everyday life and instead, simply relax and revitalise in more natural settings. With this in mind, the more you can create a feeling a “being at one with nature”, the more calming and serene your garden will be. That’s where the rewilding trend comes in. Originally introduced to protect and restore wildlife environments, homeowners are now introducing the concept into their own outdoor areas, as a way of creating a tranquil setting that’s very similar to natural environments. Design a paved pathway that takes you through plenty of shrubbery, past a shallow pond, some log and leaf piles and some bright, native flowers, to begin rewilding your garden. You’ll see plenty of wildlife wandering through your garden in no time, and you’ll own the perfect haven for relaxing in. Outdoor dining has been a popular trend for many years, especially during the warm summer months. However, recent updates to Al Fresco dining are seeing homeowners moving their outdoor dining spots to the end of their garden, as opposed to closer to the house. Relocating your outdoor dining area allows you to truly make the most of your garden, an experience which is often lost when your table is just a few steps away from the house. Taking the time to stroll amongst the different areas and features of your garden, before reaching the dining table, allows you to truly immerse yourself in what your garden has to offer. While the past few years has seen many homeowners opt for dark greys and brick reds when it comes to their paving, we’re expecting more natural colours to become a favourite this year. 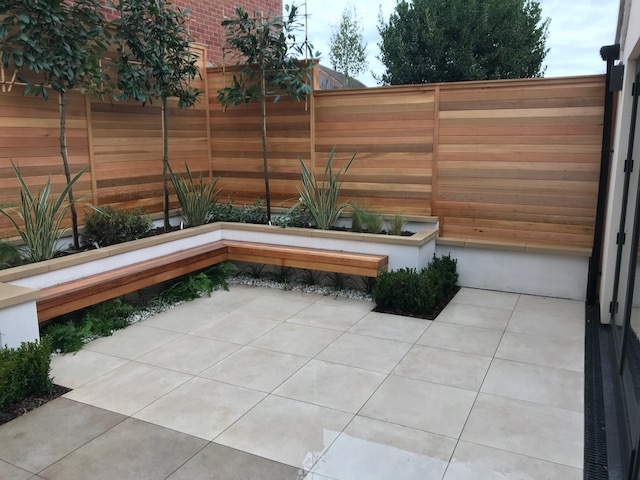 Choosing stoney shades, beiges, lighter greys and even a slight mix of different tones of a colour, creates a more natural feel to an outdoor space and helps to bring the paving together with any plants or foliage in the same area. It’s a popular trend that’s expected to continue into 2018’s paving and landscaping efforts, as more and more people aim to add a sense of natural scenery to their gardens. Contemporary gardens are said to held blend the indoors with the outdoors, so that your journey from one to the other is almost seamless. With geometric patterns and clear cut sections throughout, along with neutral shades, ambient lighting, potted plants, raised beddings and simplistic styling, these modern landscaping designs are the perfect setting to spend some time for yourself or for entertaining friends. If you’re in need of a comforting place to escape the hustle and bustle of your hectic lifestyle, a contemporary garden should be on your list of things to add to your home this year. We’ve all heard of grow your own, but this hobby is set to take on a whole new level in 2018. Gardeners are choosing to make room in their outdoor areas for “meal gardens”, where specific ingredients for their favourite healthy meals are grown together for convenience. Those who enjoy a berry smoothie will no doubt be planting a few strawberries, raspberries, blackberries and blackcurrants close to one another, whilst the salsa fanatics will make the most of onions, peppers, tomatoes and corianders growing in their garden. It’s a fun and simple hobby that can also help to keep you going with your healthy living resolutions. These are just a few of the many trends expected in paving and landscaping this year and we’re excited to see what the next new thing for gardens will be. Don’t forget to make time for refreshing your garden this spring – you’ll be thanking yourself when summer comes around.